Hello Friends, this week at Eclectic Ellapu our challenge theme is Anything Goes. I created this card with A older stamp set from Verve. It celebrates our love of purses! When my son was younger he would always make the same remark when he saw a different purse I would carry, "Mom...another new purse?!" Couldn't pull anything over on that one, it takes my husband weeks before he notices! Can anyone relate? Adrienne this is just fabulous. Love the polka dots and the embossed background. You have created a bright, fun card for the Sweet Stop Sketch challenge this week, Adrienne! Thanks for playing along with us! The Verve stamp is so sweet - and looks great in those gorgeous colours against the embossed background. By the way, I am called the 'bag lady' at my house, as I am always collecting another purse - lol! Beautiful card Adrienne. Love the bags! Lovely- I think I'm more into handbags as well...I don't do heels these days! This is so cute! Love handbags too! 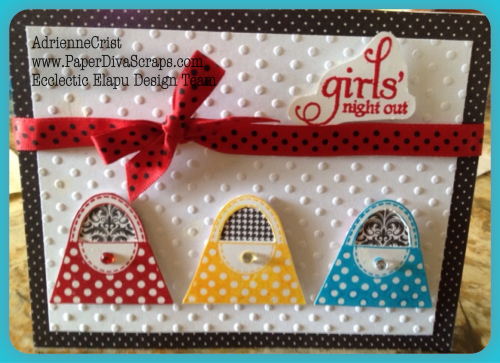 Fun colors and polka dots.. all the main ingredients for a cute card, Adrienne! These purses are so cute and the ribbon is a perfect match, too! Thanks so much for joining us at The Sweet Stop this week! Delightful, and I see how you made the leap from the shoes to the handbags. Happy LIMing! Such a fun card, Adrienne! Great take on this week's sketch. Thanks for joining The Sweet Stop! I love the bright colors and polka dots! Great card!